Sunset Cottages at the beach - Best value in Fort Walton Beach. *This is a beautiful beach-side condo complex with direct beach access. You will only need to walk 300 feet from the condo's boardwalk and your feet will be in the beautiful white sand of the beach. This is a family friendly unit as Sunset Cottages is a private, cozy, peaceful, modern complex with only 19 units. Stay with your family at our personal family owned, home-like beach retreat... Ultra-convenient beach condo on the Gulf side with a short walkway that is only steps to the beach... right next to the units. No driving and parking to get to the beach... You are there! PROFESSIONAL UPGRADES & ACCOMMODATIONS ... The small newer complex was built new in 2000. 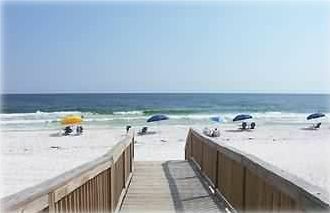 The complex is very family friendly and is located on the quieter end of Okaloosa Island. Golfing, water parks, jet-ski, charter fishing, shopping, and lots of fresh seafood are only minutes away. The quiet pool and sun deck area are located in the center of the complex with a new outdoor grill area right next to it. CONVENIENCE... Our main balcony overlooks the pool. There is also a second separate balcony off the master bedroom for privacy and coffee in the morning. The units are surrounded by nice tropical landscaping. Walk down the quiet beach walkway that is right next to the units and go for a swim in the Gulf of Mexico. Come back and then cool off in the pool afterward. Stress relief and family fun is what this place is all about! Relax, you have come to the right place. Now get ready for fun. UPSCALE DECOR & AMENITIES... Our condo can sleep six people. One private master bedroom with a king-size bed, separate private balcony, and separate private door to bathroom. One pullout queen sofa in the living room and two bunkbeds located off the hallway and out of the way, great for the kids and private for the parents! The condo has a full-size kitchen... dishes, cookware, utensils, toaster, microwave, coffeemaker, dishwasher, all linens, and towels. New a/c unit was installed June 2012. EVERYTHING YOUR FAMILY NEEDS... There is one full bath with two entrances, Wi-Fi, cable TV (two) one in living room and the other in master bedroom, DVD in living room, A/V jacks for play station, AM/FM/CD stereo, and lots of clean Florida beach breezes! The other balcony off the main room overlooks the pool. This is a great family value. You will LOVE the homelike accommodations, price, and all the convenience. HOPE TO SEE YOU SOON AT SUNSET COTTAGES! We are so happy to be able to spend time at Sunset Cottages and to share the condo with guests. We chose Sunset Cottages because it is so close to Destin (5 miles), but without the hectic traffic of Destin. We love the fact that you can have your toes in the sand within minutes of walking out the door of our condo. Within 300 feet you can feel the sand between your toes and hear the sounds of the ocean. It is so serene! We are BEACH SIDE, 300 feet from the BEACH! Beach walkway -concrete . One small three story building between us and the beach. No roads to cross. Towels provided; all guests need to bring are their beach towels. Sleeper sofa and two comfortable chairs. Black and Decker; need paper filters for your trip. Flat screen televisions in bedroom and living room. We have two separate ones. Private in bedroom & the main off living room. Our balcony overlooks the pool. Ultra clean & modern. Two balconies, one overlooks pool & grilling area next to pool. Raft rentals, beach chair & umbrella rentals available at the beach. Concrete beach walkway 300 ft to the beach. Ultra convenient. We really enjoyed our stay! The place was well taken care of. The kitchen had everything you needed for your vacation. We will definitely be back again soon. We felt right at home. Would love to stay here again. Thank you so much for opening your home to my family. We needed the escape and we can think of no better place. We are more than happy with our stay. We will definitely look to stay there again in the future. It was very clean and very quiet, we enjoyed our stay better than a big named condominium! We absolutely loved the heated pool on the property and the walk to the beach was very fast and closer than we thought! Everybody was so nice in the surrounding units and even some owners of other units were making sure that we had everything we need!! Talk about an A+ rating from us. We will definitely be back!! We are thrilled that you had a wonderful time. Providing a clean, updated and fresh condo is very important to us. Thank you for taking such good care of our condo. Beaches were beautiful,as I was lucky to have good wheather,I also felt as to instruction on every door you opened had a instruction as I felt like my mother was there. In saying that I left it cleaner then when I got there. 'Big Kahunas' Water Park, Snorkeling, Fishing Charters, Dolphin Cruises, Shell Cruises, 'Gulfarium', Fishing Pier.